Three years ago when we bought our house, I decided I wanted to put in surveillance cameras. When selecting the cameras, I decided that the cameras had to be powered by PoE (Power over Ethernet) so that I could change out the cameras later on if I wanted to and didn’t have to worry about dragging a separate wire for power which could be different for different cameras. At the time I was looking, the number of small, fanless switches that did PoE was quite small. I decided on a Cisco SG300-10P which is a 10 port managed switch with 8 of the ports being PoE. The managed switch was definitely overkill for what I wanted, but an unmanaged gigabit PoE switch without a fan was nowhere to be found. The switch has worked fine for my needs. Since then, I’ve experimented with other unmanaged PoE switches (a 16 port one with 8 PoE ports) as I needed more ports. The Cisco switch works fine, but I really didn’t do much with it. Last year after I tried out Ubiquiti’s UniFi AC Access Points, they asked if I wanted to test their new UniFi Switch 8 port switch that was coming out. Of course, I said yes! The switch, like other products in the UniFi line is controlled by the UniFi controller software. As I’ve mentioned before, the software is quite utilitarian, but works well. The switch easily integrates with my access points and is simple to setup. One of the things I dinged the UniFi access points for (not the Pro) was the lack of 802.3af PoE requiring the use of a power injector. Well, like other switches in Ubiquiti’s line of switches, the 8 port switch provides passive PoE to individual ports if configured which will power the UniFi access points. So now that I had a UniFi switch, that negative point of having to use a power injector no longer applied. My needs of a switch are pretty minor; I just need PoE provided to cameras and I need it to pass VLAN traffic for my guest WiFi network. The UniFi Switch 8 easily does that and a whole lot more. The controller interface works and I love being able to see statistics and have control over much of my network from one screen. I really would like 10 ports and the switch has 2 SFP ports. Normally SFP ports are used for fiber connections, but they also support copper modules. I’m in the process of trying to get working copper modules from Fiberstore which is proving to be difficult; of the 6 I ordered, only 1 worked. Their support is good, but being in China, it takes a long time to get replacements. I would rather have had a combo RJ-45/SFP port like the Cisco switch has, but the SFP modules will eventually work. One of the things I’ve overlooked until recently in a managed switch is the ability to use SNMP and monitor traffic. There is no real use for watching the traffic, but I find it interesting. I have monitoring for my access points and my Cisco switch as well. With a retail price of $199, who should buy this switch? For most home users, there is no reason to purchase this switch. However, if you’ve bought into the UniFi line of products (which I’m quickly doing as unified management is excellent and gives me lots of control), then getting a UniFi switch should be a no brainer. To me, multiple 8 port switches beat out the 24 port switch due to the lack of fans. Yes, it would cost more, but in my setup, I try to keep noise at a minimum. 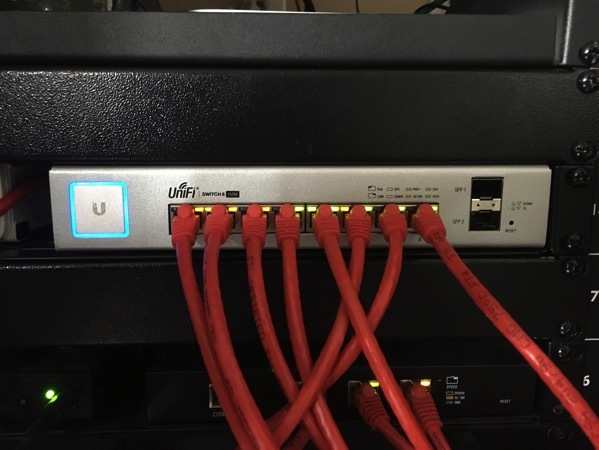 While the UniFi Switch 8 isn’t for everyone, I’ve been quite happy with the Ubiquiti products and plan to purchase one of the 8 port switches to replace my Cisco switch (I’m waiting until the SFP modules work properly as I actually need 19 ports between my 2 main switches). The unified controller makes things very easy to manage. The Cisco switch has lots more options exposed, the UniFi switch can do a bunch with the command line; however, I haven’t had to touch it. Standardizing on UniFi switches will also allow me to possibly use their UniFi Video cameras including their new 1080p as those are powered by 24V passive PoE which the switch will provide (if you’re listening, Ubiquiti, I have 7 cameras and would need an NVR to go with it :-)). If you’re going all in on Ubiquiti products, getting one of their switches should be a no-brainer. Note:The UniFi Switch 8 was provided to me by Ubiquiti at no cost for testing and review. It should be clear that my review is not biased by this as I plan on purchasing another switch with my own money. Any idea were I can get this switch. No stock on the website. Unfortunately it appears that the switch is out of stock everywhere. What I’ve read indicates that Ubiquiti’s store will get them in a few weeks. What type of POE cameras are you using and are you happy with them. I am looking to do a similar POE setup and am always interested in peoples actual hands on experience. I’m using some Dahua 720p bullet cameras. They work adequately, but aren’t the greatest. The settings are weird and the profiles for video settings are time based and don’t adjust for time changes which makes the video kind of washed out during certain times of the day. At some point, I’ll replace them, but they’re good enough for now. I really like the UniFi systems and would love to replace my cameras with a UniFi setup including DVR, but that would cost well over $1200 and I can’t justify that for a personal system. The UniFi central management would simplify setup and adjustments whereas the Dahua setup is on a per camera basis. The UniFi cameras I’d get (https://www.ubnt.com/unifi-video/unifi-video-camera-g3/) operate on 24V passive PoE which this switch supports. Did you get ever get the copper SFP modules working correctly? If so, which model are you using with the UniFi Switch 8? I put one in my UniFi Switch 8 and one in my UniFi Switch 16 (Fiberstore modules are in the other 2 SFP ports). So far so good on the modules! Thanks Scott!! Based on the Amazon reviews and your input, I will give them a shot. The modules run a bit hot (so do the Fiberstore ones), but seem to be running fine. I just plugged them in and they worked. I needed the extra ports and so far everything is working great. Previous PostPrevious Plateau for Mac processors?